To create this look, iron on the DYNO image on a white t-shirt. This is a large iron-on so section it off when applying the heat from the iron. I did a section at a time and then peeled back the white backing paper and then another section until the image had released from the t-shirt. Add color by using the Tumble Dye sprays. Just spray on the shirt in different places with different colors. Use fabric markers by S.E.I. 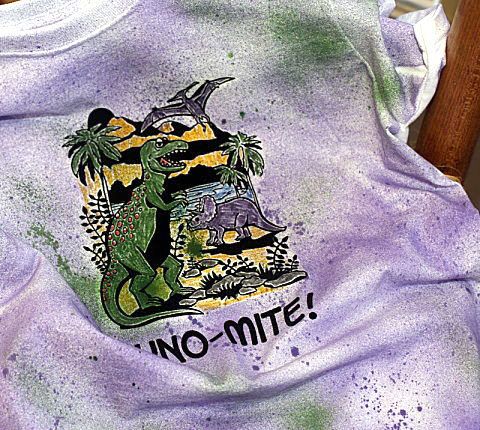 to color the DYNO-MITE image. That is the fun part! 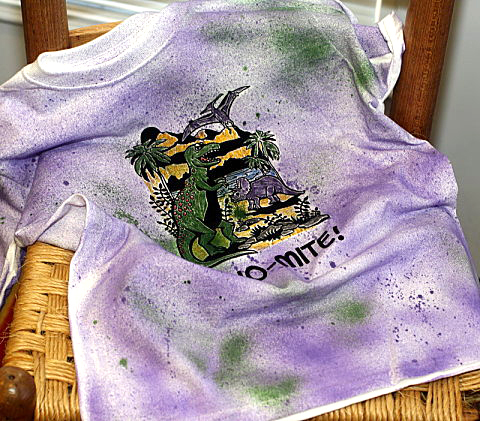 You can even use the Tumble Dye, with a small paint brush, to color in the image. Very fun and kids will love creating their own custom t-shirt.